This is one of the best elytra maps and while it can offer fascinating levels and smart scoring system not only for you but also for your friends. Elytra is some kind of wings that allow you to soar in the sky and smoothly to land on the ground. Elytra chained the attention of the map makers in Minecraft Bedrock and became very often used in different challenges. 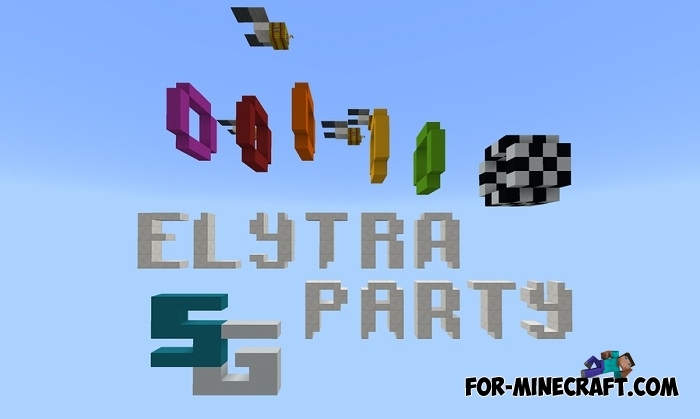 Elytra Party has no restrictions on the player skill: there are 6 modes designed for absolutely different people from beginners to professionals. Choose one and jump into the free flight flying through the colored rings. Do not go out of the way and do not miss the rings and then you will definitely reach the finish line.